I predict this new effort will end in failure, partly because the police are unwilling to use their so-called secret weapon against stalkers and partly because the laws preventing stalking are fatally flawed. I never wanted to be prophet, but that’s unfortunately what I have become. On May 2, this prediction became an augury. Yumi Imura, 38, was violently stabbed to death on the streets of Osaka’s Hirano Ward. She had been working as a part-time bar hostess. Imura had filed a complaint with the Osaka Police Department in early March, noting that she had received a deluge of unwanted emails and messages from the man, some of which were clearly death threats. The police first ordered the man to stop the behavior by phone. When that didn’t work, they summoned him to the police station and handed him a formal warning in writing. The pen may be mightier than the sword, but a piece of paper is no shield from an obsessed predator. There’s no denying that Japan’s stalking laws are flawed, weak, out of date and ineffective. The process of actually putting a stalker behind bars is extremely laborious; the hurdles are high and the punishments are low. The maximum penalty is up to a year in prison or a fine. It’s a two-step process before the police can even issue a restraining order. The perpetrator has to violate the restraining in order to receive the maximum sentence. 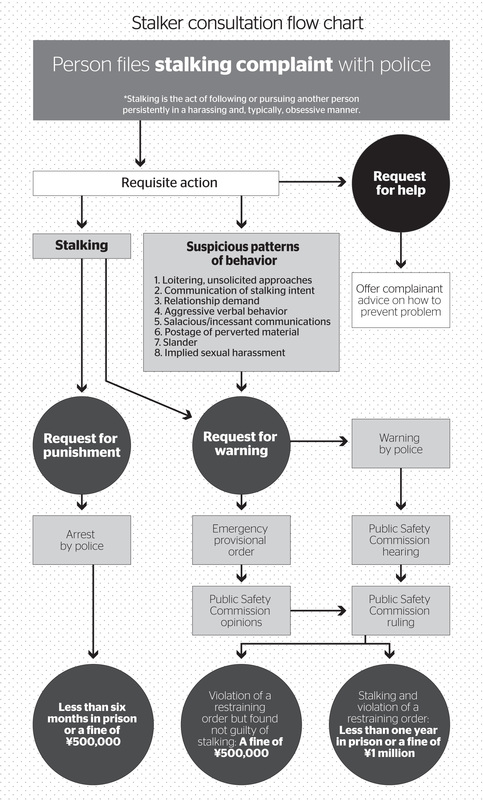 The Osaka Police Department flow chart of how stalking cases are handled shows a complex process that’s as difficult as navigating a maze. What’s more, many stalkers are smarter than the law and the law enforcement officers. If they can’t approach the object of their desire, they hire a proxy. If they don’t know where their victim has gone, they hire private detectives to locate them. If the law forbids sending emails or phone calls, they use social networking services such as Twitter to harass victims. Stalkers are often very bright and if there are loopholes in the law, they find them. It’s worth noting that the anti-stalking laws have as many loopholes as a badly crocheted sweater. In Imura’s case, one of the criticisms leveled at the Osaka Police Department is that officers should have arrested the stalker on charges of intimidation upon discovering he had sent her death threats. Those charges alone could have earned him up to two years in jail. It’s probably not surprising that those charges have nothing to do with anti-stalking laws. In most cases, police officers use every other law at their disposal to handle stalkers because it’s easier to make the charges stick and the punishments are more severe. The initial investigations are slow and it takes a significant amount of time for police to issue a warning. Statistically, the numbers are abysmal. In the 21,089 stalking complaints filed last year, only 2,452 warnings and 34 cease-and-desist orders were issued. However, a shortcut is available that allows police to warn a stalker once and then arrest him almost immediately if he or she persists. It does not require the standard warning but immediately sets the stage for faster action. It’s known as a “provisional (anti-stalking) order,” or 仮命令, and is used in an emergency situation. It speeds up the process and enables police to jail a stalker before they are able to harm their victim. Admittedly, the conditions for which this secret weapon can be used appear to be very limited but the police generally don’t hesitate to interpret the law broadly when they need to. So, dear readers, guess how many times this “stalker missile” has been launched since the law was first implemented almost 14 years ago? The domestic courts aren’t much better either. In December, former Miss International Ikumi Yoshimatsu asked for a restraining order against a talent agency executive who allegedly stalked her and, almost certainly, sent private detectives to her home. The court still hasn’t made a decision on this request and the judge presiding over the case has already changed once. So much for fast and speedy protection. Yoshimatsu and Akie Abe, the wife of Prime Minister Shinzo Abe, launched a petition to revise Japan’s anti-stalking laws and protect women. More than 131,000 signatures have since been added to the document. It will be submitted to the government and, hopefully, the first lady will be able to hand it to her husband behind closed doors as well. And so the question remains: Even with stronger anti-stalking laws on the books in future, will it make a difference if police officers don’t fully utilize the laws they already have? It’s one thing for a law to be available, it’s another to proactively enforce it. I predict this year the police will again fail to issue even one emergency provisional restraining order against a stalker. For the sake of potential victims, I’m hoping I turn out to be a terrible prophet.